Mobile-CRISPRi from the labs of Jason Peters, Oren Rosenberg, and Carol Gross provides a streamlined suite of tools for using CRISPRi in many types of bacteria: lab-adapted, environmental isolated, and disease-associated. Mobile-CRISPRi offers two advantages over existing bacterial CRISPRi methods. First, its modular design allows for customization with strain-specific promoters, antibiotic resistance selection markers, gRNAs, and dCas9 proteins. Second, it can be introduced into a broader range of bacteria. Once transferred, Mobile-CRISPRi stably integrates into the genome and is propagated during normal DNA replication and cell division. Mobile-CRISPRi does not disrupt gene function and is stable and active for greater than 50 generations. 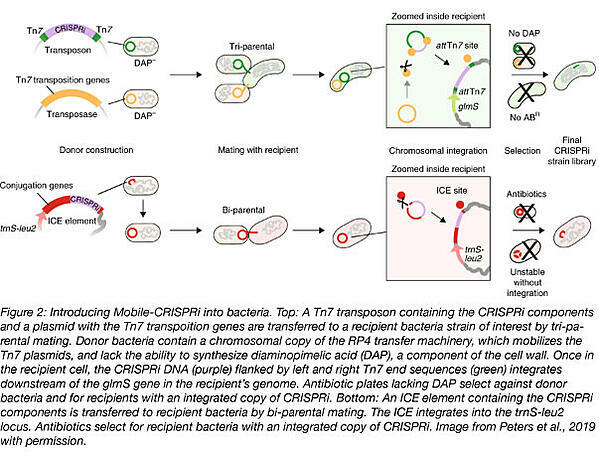 For gram negative bacteria, Mobile-CRISPRi is introduced using the bacterial Tn7 transposon system. This system has two parts: a plasmid expressing the Tn7 transposition genes (tnsA, tnsB, tnsC, tnsD, and tnsE), and a plasmid that contains the Mobile CRISPRi cassette flanked by left and right Tn7 end sequences. Donor bacteria with a chromosomal copy of the RP4 transfer machinery mobilize these plasmids for transfer to recipient cells during a tri-parental mating scheme. 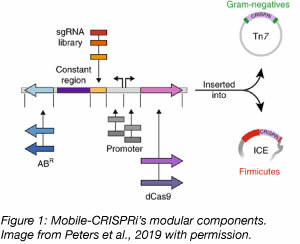 Mobile-CRISPRi integrates downstream of the highly conserved glutamine-fructose-6-phosphate aminotransferase (glmS) gene in the recipient bacteria due to site selection by TnsD, a sequence-specific DNA binding protein. Selection removes donor bacteria and recipient bacteria that lack an integrated chromosomal copy of Mobile-CRISPRi. For firmicute gram positive bacteria, Mobile-CRISPRi is introduced using the bacterial integrative and conjugative elements in Bacillus subtilis (ICEBs1) system. ICEBs1 carries the genes needed for conjugation, but can also carry cargo genes, like Mobile-CRISPRi. The Mobile-CRISPRi ICE element is first introduced into the B. subtilis genome. Mobile-CRISPRi is then transferred from B. subtilis to the bacterium of interest following IPTG induction of conjugation genes and bi-parental mating. Following excision from the B. subtilis genome, the Mobile-CRISPRi ICE element forms a conjugative plasmid-like DNA circle and is transferred to recipient bacteria where it integrates into the trnS-leu2 locus. The team showed that Mobile-CRISPRi is transferable into multiple bacterial species including several involved in human disease. However, the rate of transfer was variable. They measured transfer rates by comparing the number of colonies that grew on a selective plate versus the number that grew on a non-selective plate. Most bacteria tested had 1 transfer in every ~100 to 1,000 colonies, but some bacteria, including E. faecalis and P. mirabilis, had only ~1 transfer per 1,000,000 colonies. Higher transfer rates are better suited for genome-wide CRISPRi library screening experiments where maintaining library diversity is important, while lower transfer rates are only suited for single-gene knockdown experiments. Mobile-CRISPRi expands CRISPRi to non-model bacteria including pathogenic strains and environmental isolates. For example, Peters and colleagues used Mobile-CRISPRi to knockdown individual genes in several bacteria associated with human disease (S. aureus, Klebsiella pneumoniae, and P. aeruginosa) in addition to Vicrio casei, a bacteria isolated from cheese. Knockdown efficiency, as measured by knockdown of a constitutely expressed RFP reporter, was variable across bacterial strains, ranging from an ~8 to 150-fold reduction, with a median knockdown of ~40-fold across all species measured. Beyond understanding the basic biology of bacteria, Mobile-CRISPRi can be used to identify antibiotic resistance genes. Genes that are targets of antibiotics are often essential genes which creates a challenge when studying them since their complete knockdown is lethal. Incomplete or titratable knockdown, however, keeps bacteria viable and allows researchers to study if that gene is a target of an antibiotic. For example, let’s take a look at the essential gene folA which encodes the target for the antibiotic trimethoprim. When Enterobacter aerogenes, Klebsiella pneumoniae, and P. aeruginosa (all opportunistic pathogens) were grown in presence of trimethoprim, cultures treated with a folA gRNA were more sensitive to trimethoprim when compared to control gRNA treated or untreated bacteria. Had the folA gene product not been a target for trimethoprim, there would be no changes in sensitivity. Pooled knockdowns are also possible with Mobile-CRISPRi. As a proof of principle, Peters and colleagues constructed a 40-member library targeting 20 genes of Enterobacter cloacae, a bacterium that’s part of normal human gut flora. Guides targeted essential and non-essential genes with two guides per gene. The library was grown in glucose minimal media with 100-fold excess of wild-type bacteria and the relative frequency of each of the 40 library strains was measured after 6 and 12 generations with or without induction of CRISPRi knockdown. As expected, bacteria expressing guides that target essential genes were less represented while bacteria containing guides targeting non-essential genes remained constant, with fitness effects more pronounced at 12 doublings than at 6. Mobile-CRISPRi can be used in non-model bacteria species where its modular nature allows for the customization of guides, promoters, selection markers, and different versions of dCas9. Following integration, Mobile-CRISPRi is stably expressed with no selection required and titratable knockdown allows for the study of essential genes such as those involved in antibiotic resistance. Are you ready to move Mobile-CRISPRi into your bacteria of interest? Find Mobile-CRISPRi plasmids at Addgene! Auchtung, Jennifer M., et al. "Biology of ICEBs1, an integrative and conjugative element in Bacillus subtilis." Plasmid 86 (2016): 14-25. PubMed PMID: 27381852. Choi, Kyoung-Hee, et al. "A Tn7-based broad-range bacterial cloning and expression system." Nature methods 2.6 (2005): 443. PubMed PMID: 15908923. Johnson, Christopher M., and Alan D. Grossman. "Integrative and conjugative elements (ICEs): what they do and how they work." Annual review of genetics 49 (2015): 577-601. PubMed PMID: 26473380. PubMed Central PMCID: PMC5180612. Libby, Elizabeth A., and Pamela A. Silver. "Harnessing undomesticated life." Nature microbiology 4.2 (2019): 212. PubMed PMID: 30675034. Peters, Jason M., et al. "Enabling genetic analysis of diverse bacteria with Mobile-CRISPRi." Nature microbiology 4.2 (2019): 244. PubMed PMID: 30617347. PubMed Central PMCID: PMC6424567. Peters, Joseph E. "Tn7." Mobile DNA III. American Society of Microbiology, 2015. 647-667. PubMed PMID: 26104363.